Remnants of a local gold stamp mill will be preserved on McDowell County land whose history unites last year’s Brackett Town series of this blog with the current Nanney Saga. According to an article in McDowell News on May 25, 2014, twelve acres owned by conservationist and Epic Games founder Tim Sweeney was donated to the NC Gold Foundation of Marion. This group plans to rebuild the mill and establish a gold museum similar to the one in Dahlonega, GA, where 250,000 tourists attend the annual Gold Rush Days celebration. During the 1800’s NC gold rush, this site on Polly Spout Road is where miners took their ore to be crushed to expose the gold hidden inside. Gold flakes were then pressed into coins. It was owned by the Vein Mountain Mining Company and fed by a stream of water “from the Devils Ball Alley close to 221 South and Spooky Hollow Rd,” said Doug McCormick, owner of today’s Lucky Strike Mine. The water flowed through ditches and wooden flumes, about ten miles of water aqueduct. (See Part 19 and Part 22 of Brackett Town series of this blog). After washing the crushed quartz, the water was returned to a cistern for reuse. 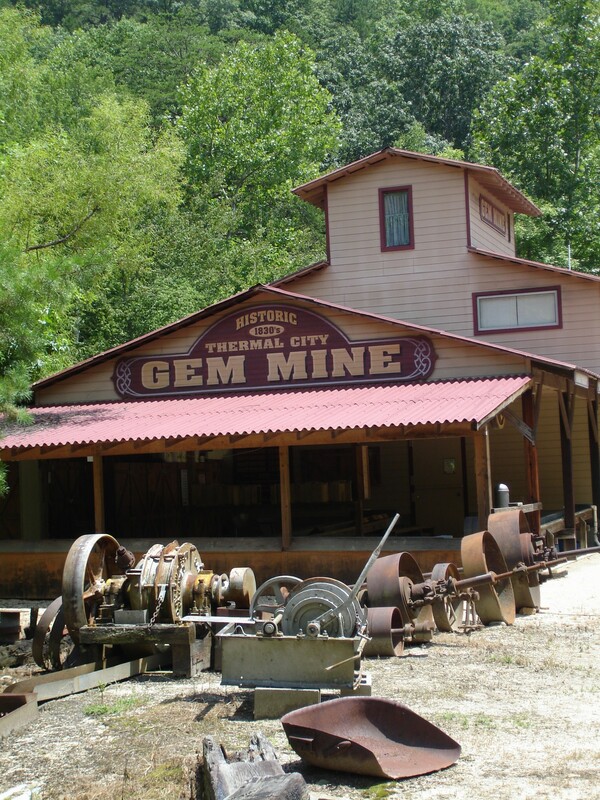 Lloyd Nanney, son of Paul Nanney and nephew of this blog’s Wade Nanney, owns the Thermal City Gold Mine that will be connected to the stamp mill and the Lucky Strike by a new NC Gold Trail. Neighboring Rutherford County is supporting this enterprise to promote tourism for their historic Bechtler Mint, the local alternative to Philadelphia before the mint in Charlotte was built. Our county needs the revenue, but Lord have mercy! 250,000 tourists???? Oh my! This entry was posted in Brackett Town Saga, Nanney Saga, Setting. Bookmark the permalink.